Rumors of green’s demise are being greatly exaggerated. In this year of fiery political passions, the word “revolt” is in the air. However, I think Ad Age inhaled a whiff of the zeitgeist and incorrectly applied the term to consumers supposedly cooling in their ardor for green products. “Has Green Stopped Giving? Seeds of Consumers Revolt Sprouting Against Some Environmentally Friendly Product Lines” trumpets the headline of a recent Ad Age article. The author quotes Timothy Kenyon, director of GfK Roper’s Green Gauge study who more judiciously describes the current situation as “green fatigue.” This may be closer to the truth. Revolt? No. Fatigue? Maybe. Dead? Not in the slightest! Fatigue implies that there are people once excited by green that are now onto something else. This may apply to journalists and pundits who fan the flames of green hype but not consumers. The Ad Age article talks about the “Gartner hype curve,” with the green market moving from the “’peak of inflated expectations” to the “trough of disillusionment” but I think that applies more to bloggers (yes, I know I’m in that group) than to American shoppers. Jacquie has blogged that “Over time, mainstream companies entering the market espoused what she has dubbed the “planets, babies and daisies” approach, believing such imagery represented a price of entry into the market”. Today of course we all know better than to slap on environmental imagery and expect consumers to take the bait. Let’s call the “planets, babies, and daisies” approach Green Marketing 1.0. Jacquie has then defined Green Marketing 2.0: “Now such brands as GreenWorks or Tide Coldwater are realizing that the name of the game is doing what they do naturally—leading with messages of primary benefits—the main product features people consider when buying a product—while bringing in environmental messages as secondary.” With detergents, it’s going to be cleaning ability and price. So an environmental message can be seen as a tie-breaker for many mainstream consumers. And for other mainstream consumers, products’ relative greenness is a total non-factor in their purchase decisions for a wide variety of reasons including a perception that buying green has no relevance to their lives. Must a product’s environmental friendliness forever be relegated to the role of tie-breaker at best in mainstream consumers’ minds? Maybe not. I say let’s revisit Jacquie’s “planets, babies, and daisies” but don’t throw the baby out with the planets and daisies. To really succeed on a wide scale in America, green products either need to establish their superiority on conventional, non-green product features such as effectiveness or price, or make green more relevant to people’s everyday lives. If green marketers can build the case for how their products are healthier for baby and Mommy and Daddy and Grandma and.., then the greenness of a product becomes a primary benefit rather than a secondary one and the higher hanging fruit now becomes more attainable. That’s Green Marketing 3.0. Green Marketing 2.0 has helped green products find new audiences by creating green products that work and are affordable but we may be starting to see the limits of this approach, at least in the current environment. 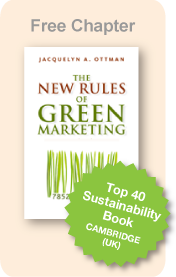 To ascend to the next level where green goes truly mass market will require Green Marketing 3.0, where buying green is tied to the health of both humans and polar bears. Jeff Dubin is the founder and principal of Green Meridian, a marketing consultancy that provides custom research and advice for green consumer product marketers. He is a graduate of Columbia Business School.